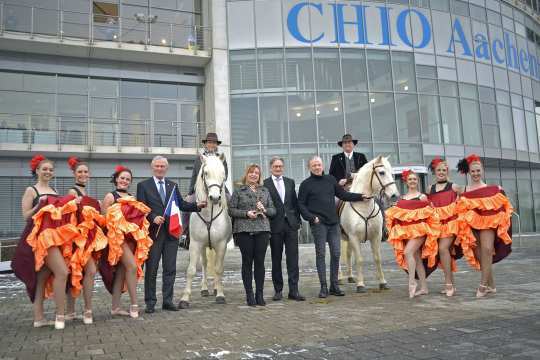 The CHIO Aachen (July 12th-21st, 2019) is looking forward to welcoming France as its official partner country. Among others, the magnificent “Garde républicaine” and the world-famous “Cadre Noir” have confirmed their participation in the Opening Ceremony on Tuesday, July 16th. “The CHIO Aachen is a synonym for world-class equestrian sport, but has long since stood for world-class entertainment too,” said Carl Meulenbergh, President of the organisers, the Aachen-Laurensberger Rennverein e.V. (ALRV). The Opening Ceremony in particular has established itself as a spectacular show that is thematically speaking very closely linked to the partner country. The Show Director, Frank Kemperman, is looking forward to the official representatives: “It is fantastic that we are going to be able to present the Garde républicaine and the Cadre Noir to our audience.” The Cadre Noir is the most famous French riding school, the republican guard is a cavalry regiment, the tasks of which include among others protecting the French President. The latter recently stayed in Aachen, when he signed the “Aachen contract” together with Angela Merkel. “This contract served the purpose of renewing the German/French friendship, with France as the partner country of the CHIO Aachen, this friendship will be filled with life,” according to Dr. Angelika Ivens, the French Honorary Consul and Chief Executive of the Francais Aachen Institute. There is an incredible amount of logistics involved in the Opening Ceremony. More than 1,000 extras and several hundreds of horses will be taking part in the event – among others a herd of Camargue horses are awaited. Of course, the world-famous French-bred horses will also play a major role. The biggest challenge for the director is that not only the 40,000 spectators in the stadium, but also the TV viewers at home want to be entertained by a dazzling show: “We have to stress the eyes, surprise the audience, make sure the timing is perfect and simply every second has to be thrilling,” stated Uwe Brandt. The Artistic Director of the Aachener Grenzlandtheater has been supporting the CHIO Aachen team as the creative mind behind the show since 2015. He works closely together with the WDR on the Opening Ceremony, because the public TV channel will be broadcasting the show live from 8.15 p.m. onwards. France will not only shape the Opening Ceremony, but indeed also the entire ten days of the CHIO. For example, the partner country will form the basis for both of the “Horse & Symphony” concerts (July 12th and 13th, 8.30 p.m.), furthermore the exhibitor area, the CHIO Aachen-Village, is being enhanced by a “Rue France” this year.